Lavera Vegan "Illuminating Eyeshadow Quattro" is the palette of eye shadows essential to obtain an intense and luminous look. Its 4 trendy and sublime shades allow you to create combinations of infinite shades. Rich in natural light-reflecting pigments, this Lavera Vegan Eyeshadow Palette brings light and sparkle to your eyes by revealing their natural beauty. 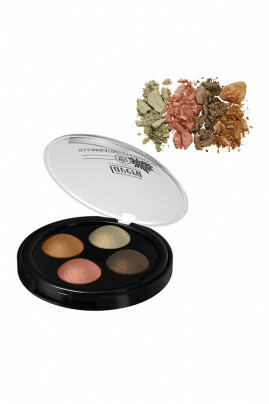 The silky texture of these eyeshadows offers easy and precise application. They promise a long-lasting outfit for sparkling, brilliant eyes all day long! - Dry application : you use it dry to bring more brightness to the eyes. - Wet application : thanks to a simple drop of water added to the eyeshadow, you will get a much more intense color. The Eyeshadow Quattro Illuminating Eyeshadow Palette Vegan Lavera has a natural composition !